Dorney Park in Altoona, PA learned the hard way this week that when it rains, it pours. (or maybe when it snows, it blizzards). A member of the Cedar Fair chain, the park saw not one but two major media events – and neither one was positive. Last Sunday, after the park had closed – four teenagers were able to enter the park, and somehow scaled the 200 foot tall “Dominator” free fall ride to steal one of the large flags at the top. “Dominator” is a triple S&S tower. Not a great start to the week, admittedly. But then it got worse. Much worse. Christopher Emery, a special-needs individual had worked at the park for 12 consecutive years, cleaning bathrooms. When he went in for his annual interview with managers, he apparently didn’t do well. So much so, they decided not to rehire him. When his friend – who also works at Dorney Park found out – he jumped onto social media to vent his frustration. Outside of having a bad interview, there wasn’t apparently any other reason for not rehiring him. Within a matter of minutes, both #ShameOnYouDorney and #ShameOnYouDorneyPark were trending locally in the Philadelphia area as well as in the online amusement community. Social media is a double edged sword. You can rise and fall very quickly and you’re always under a microscope. Parks can’t afford to not have a social media person ready to go at any time and not monitor their feeds constantly. No engagement is walking tightrope without a net. Dorney eventually responded – but only issuing one statement and not responding to individuals only incited more anger towards the park. One of the best examples of handling a crisis of late came from overseas. Alton Towers not only immediately issued statements on an incident on the Smiler via their social media channels – they responded to their guests’ questions and complaints – ALL OF THEM. And it wasn’t a canned response either – it was custom for each one. It just goes to show the power of social media in this new era – and that trying to avoid it is only inviting trouble. As for Dorney Park, let’s hope this week is a bit more calm on the media front, for their sake. Could Cedar Fair offer a “California Season Pass” instead of a Platinum Pass? Your standard SEASON pass, which gets you admission into a single park. The GOLD Pass, which in NorCal gets you admission to: California’s Great America, Halloween Haunt, Gilroy Gardens and free parking at each park. And finally, the PLATINUM Pass, which gets you admission and free parking to ALL the Cedar Fair owned parks. 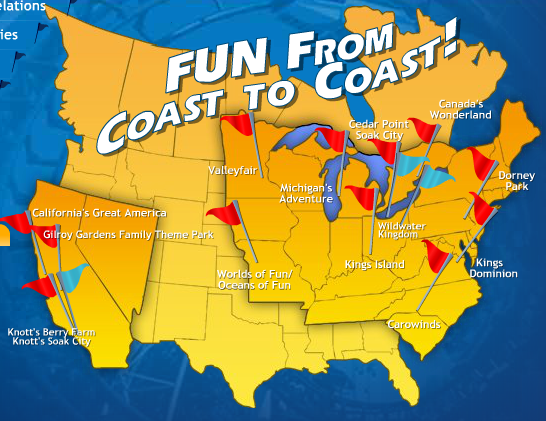 Most of us in California, however – never get a chance to leave the Golden State, which makes upgrading to a PLATINUM pass very cost prohibitive, considering the next closest Cedar Fair park besides Knott’s – is World’s of Fun…in Missouri. That’s a long road trip to use your Platinum Pass to it’s maximum potential. That being said, I believe there’s room for Cedar Fair to debut a fourth tier of passes – the CALIFORNIA Pass. It could be positioned between the GOLD and PLATINUM passes, in terms of perks and pricing. In addition to all the benefits of a GOLD pass, it would also get you admission and parking at Knott’s Berry Farm and Soak City Water Park. Now for most people, this doesn’t seem like much to add for it’s own tier – but since the West Coast parks are so far separated from the rest of the chain in terms of distance and topography, most California park fans are content to stay IN the state and will never be able to get the full benefits out of a PLATINUM pass, unlike their counterparts in the Midwest and on the East Coast, where parks are only a drive’s day (or less) away. As a result, they may not upgrade to the higher cost tier, and forgo even visiting the other parks in California, where they could be spending money. Of course, on the flip side, if a CALIFORNIA pass was added, I know that I’d be much more willing to upgrade to it and happily drive more often to SoCal to get my Xcelerator and Monte fixes MUCH more often. 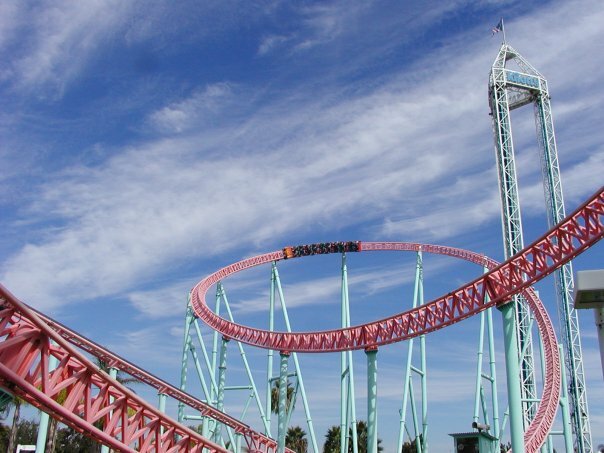 Xcelerator at Knott’s Berry Farm. Photo by Kris Rowberry. All rights reserved. What do you think – would YOU purchase a CALIFORNIA pass if it was offered? Leave your thoughts in the comment section below, or reach out to us on our SOCIAL MEDIA pages, too! March 4, 2014 | Categories: Amusement Parks | Tags: Cedar Point, dorney park, great america, great american thrills, kings island, kris rowberry, kristopher rowberry, season pass, season passes, travel | Comments Off on Could Cedar Fair offer a “California Season Pass” instead of a Platinum Pass?